This Garden Room with Veranda has got a country, rustic style to it that allows it to really sit well in our customer’s garden in Hassocks, West Sussex. 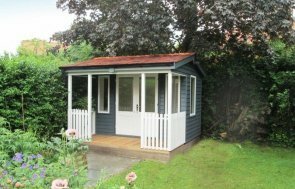 The customer bought this Garden Room to replace their old summerhouse with, and it will be used as a comfortable relaxation spot to enjoy their garden from. 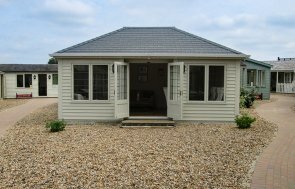 The size of this Garden Room is 3.6 x 4.2m: it has a 1.2m deep sheltered veranda at the front, making the internal size 2.4 x 4.2m, giving the customer room both inside and outside to relax in/on. 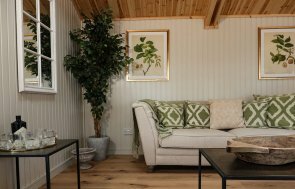 Our Garden Rooms are perfectly suited to year-round use, as they come with full insulation, double glazing, painted matchboard lining, and an electric pack with a heater as standard. To create the traditional country style they wanted, the customer opted for grey slate effect tiles on the roof, Georgian windows, weatherboard cladding, and their building has been painted in two colours from our Valtti Paint Range: Taupe for the walls, and Ivory for the doors, windows, and the picket fence that surrounds the veranda. Other features the customer chose, include polished chrome door and window furniture, white guttering, and a Light Oak lacquer on the floor. 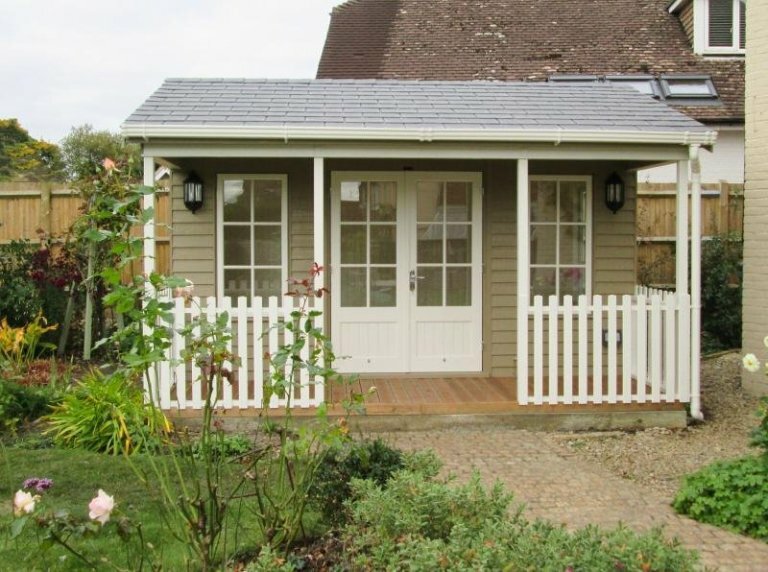 If you like the sound of a year-round use timber garden building, please look at our full ranges of Garden Rooms, Summerhouses and Garden Studios. For more information, please call us on 01760 444229, or come and visit our East Sussex Show Centre to peruse our range and see them for yourself.